From the second Bronica-roll. Leo made me cookies one day while I was at work. Unfortunately I couldn't manage to hold the camera still enough at a shutterspeed of 1/15 second.. oh well. (I've added some new prints to the print shop, + you get free shipping on your order if you buy three prints or more until the end of the month, just add discount code SEPTEMBER at checkout!). it's got such lovely colors! i'd like to eat them! 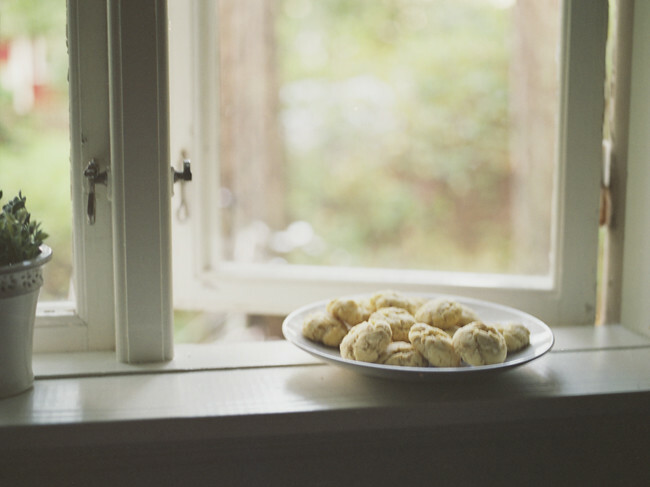 It reminds me a little bit of an old children's story, where a baker would place his pies and buns by the window to cool and the smell would travel throughout the town. Kids would travel up to the bakery trying to get the baker to give them a taste. I can't remember the name of the story but I loved it. And this photograph reminds me of it so much! lovely photo and lovely surprise from leo! Yum! Nu blev jag sugen på att baka. Beautiful colours on Your blog;)nice! i love your work, Annette! i love your photos of food. these look delicious! Such great photo, simplicity rocks! Very nice.